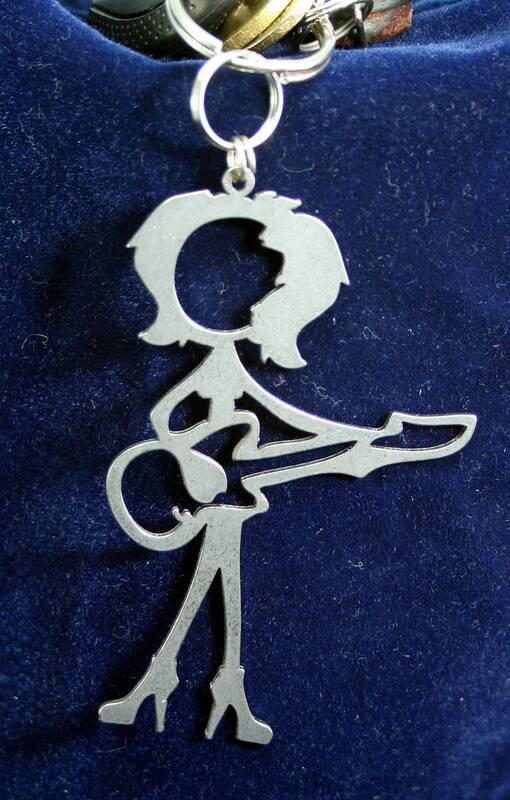 Whimsical Female stick figure playing a Guitar or Bass. Made from 18 gauge stainless steel with a semi - tumbled finish. Comes with a nickle plated 6mm and 12mm split ring. Measures approximately 2-1/2" wide by 3-1/2" tall. ***** "I absolutely love it. Well made, great size, looks good. Would def recommend to anyone. It's a keychain but can be used for other things. I used it at a Christmas ornament." I absolutely love it. Well made, great size, looks good. Would def recommend to anyone. It's a keychain but can be used for other things. I used it at a Christmas ornament.